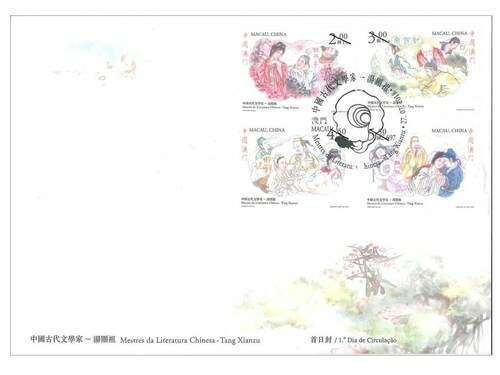 Stamp Issue "Masters of Chinese Literature – Tang Xianzu"
Macao Post and Telecommunications Bureau will issue the stamp theme “Masters of Chinese Literature – Tang Xianzu” on 27th July, 2018. 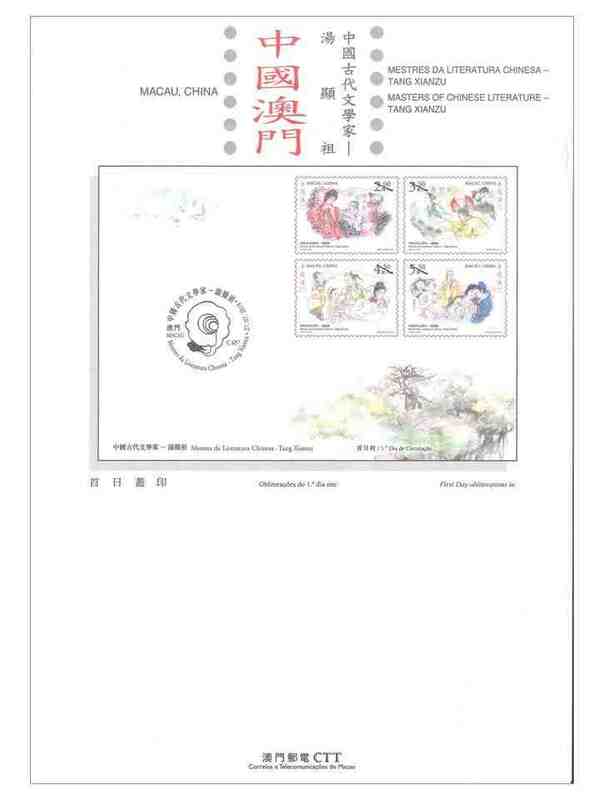 Tang Xianzu (1550-1616), a native of Linchuan, Jiangxi province. He passed the provincial civil service examination at the age of 21, and the imperial examination at 34 obtaining the academic degree “Jinshi”. Over time he held official positions of erudite in the Chamberlain for Ceremonials and secretary in the Supervisorate of Imperial Instruction, and up to officer in the Ministry of Rites. In 1591, the 19th year of the reign of Emperor Wanli (grandson of Jiajing), he wrote “Memorial to Impeach the Ministers and Supervisors” in which he criticized the imperial government. 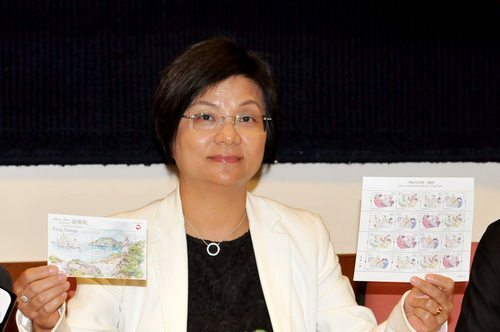 Infuriated, the emperor banished him to the Xuwen County of Guangdong in Leizhou Peninsula, and demoted him to “Dianshi” (a low-level jail warden). 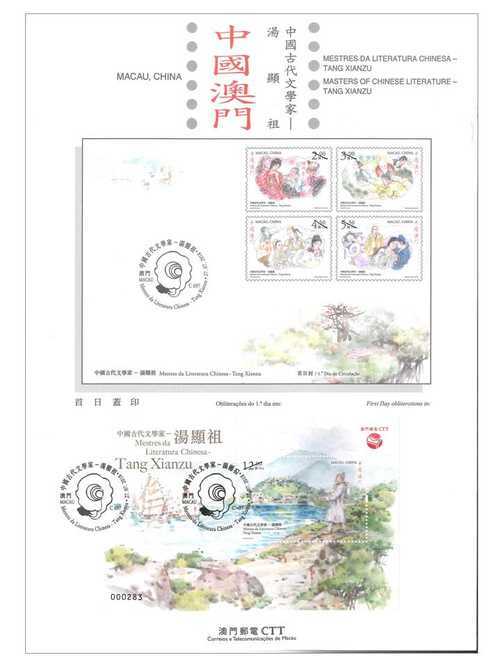 On his way to Xuwen, he passed through Macao, where he saw the Church of St. Paul, years later he included Macao in his masterpiece “The Peony Pavilion”. 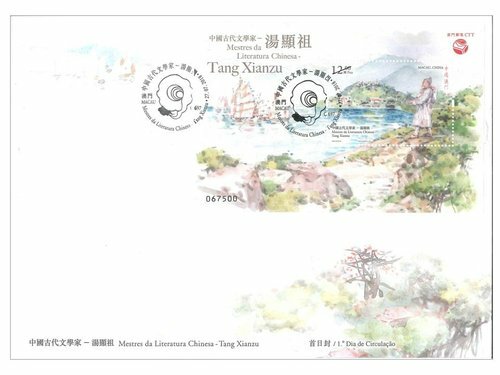 Tang Xianzu, with such an unusual trip, made him the first to have reached the area of Macao before other famed Chinese literature masters. 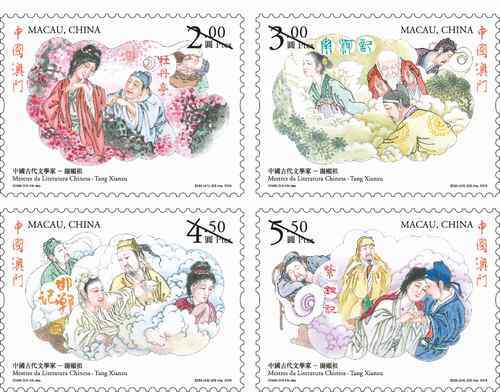 He wrote four seven-character quatrains, all of which depict the history and society of Macao in the period of Wanli, Ming Dynasty. 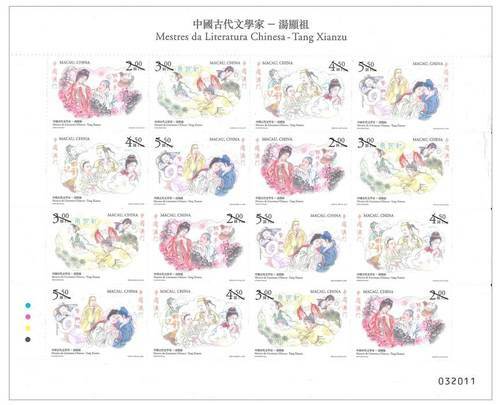 This issue includes a set of four stamps and one souvenir sheet, the four stamps are portrayed the extraordinary experiences of Tang Xianzu wrote on the four Yuanqu operas: “The Peony Pavilion”, “The Dream of Nanke”, “The Story of Handan” and “The Legend of the Purple Hairpin”, and the souvenir sheet is illustrated the footprint of Tang Xianzu’s journey through Macao. This is the seventh theme in 2018. 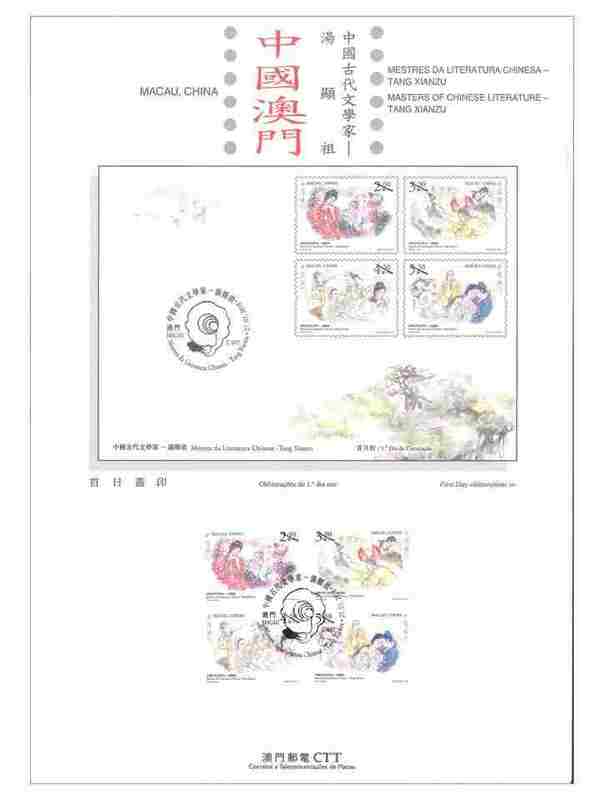 The previous issued stamps are “Lunar Year of the Dog” on 05/01/2018, the label stamp “Lunar Year of the Dog” on 31/01/2018, “Macao 2018 – 35th Asian International Stamp Exhibition (I)” on 01/03/2018, “Mainland Scenery VII” on 12/04/2018, “Classic Fables and Tales” on 30/05/2018, “Joy” on 26/06/2018, and “Chapas Sínicas (Chinese Documents)” on 06/07/2018.